After the interview spread on the Internet, her comments were criticized by the White House, the White House Correspondents’ Association, the co-author of one of her books and the agency that handled her speaking engagements, among others. Shortly after, she announced her retirement, two months short of her 90th birthday. From the archives …. How the Lobby silenced the ugly truth …. A name emerged this week on all newswires, that of Rabbi David Nessenoff. He was the man representing a group called Rabbilive. It was he that set up Helen Thomas, a set up that has been resounding throughout the world as anti Semitism. A set up that embarassed Thomas enough to resign from her position as White House Press Correspondent. The representatives of the Jewish Lobby jumped on the bandwagon ready to lynch this woman for saying what she did. Today, most likely fearing a backlash from AIPAC and other zionist terrorist organisations, President Obama climbed the bandwagon as well. It was at that point that I decided to come to the defense of a woman that has done her job well for decades. A woman that must be applauded for her past activities. But, in this particular case, she should have been more prepared for the set up. Her words were misinterpreted and for the most part taken out of context, a normal exercise of the zionists. That simply became ‘go home to Poland and Germany’. HERE you can read what the likes of the above advocate and why they should leave Palestine. 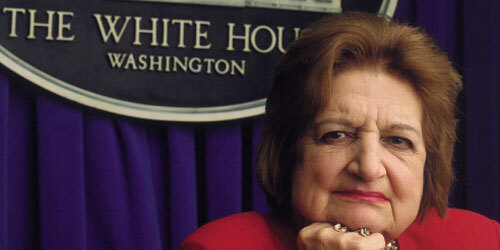 I tried to find some information about Rabbilive every link led to results about Helen Thomas, nothing else. They obviously had an agenda to discredit Ms. Thomas, probably because she is the daughter of Lebanese immigrants to the United States. They are the ones that should be out on the street, not Helen Thomas. My Son the CrazyComposer wrote a brilliant piece about this fiasco. What follows is taken from it, but his piece can be read HERE in full. A tremendous amount has been made over the words uttered by Helen Thomas recently, words spoken on May 27th, interestingly enough four days before the attack by the Israeli Defence Forces against a flotilla of unarmed civilians bringing humanitarian aid to besieged refugees in Gaza. Nine innocent and unarmed civilians wereslaughtered by the defenders of the Zionist state, but it’s not okay to criticize them, is that what we are hearing? I listened to what Helen Thomas said and listened carefully; she understands history and is more than capable of reporting her stories without bias. When asked if she had anything to say about Israel she said, ‘tell them to get the hell out of Palestine.’ When asked if she had ‘anything better’ to say, Thomas continued, ‘remember, these people are occupied, and it’s their land; it’s not German [sic], it’s not Poland.’ Having heard this answer Rabbi Nesenoff, the man conducting and filming the interview, proceeded to ask a loaded question that indicated he fully understood that Thomas was discussing contemporary immigrants, not Jews who had been born Israel.